From the ridiculous to the (almost) sublime, “Timestop” is by leagues the best episode of Land of the Lost‘s third season, and it’s probably not coincidental that it’s the only one of the thirteen to have any writing or directing input from somebody who worked on the show’s first two years. Tom Swale had been a “production coordinator” – I’m honestly not sure what that entails – on season one and moved up to associate producer on season two, where he contributed two excellent stories. 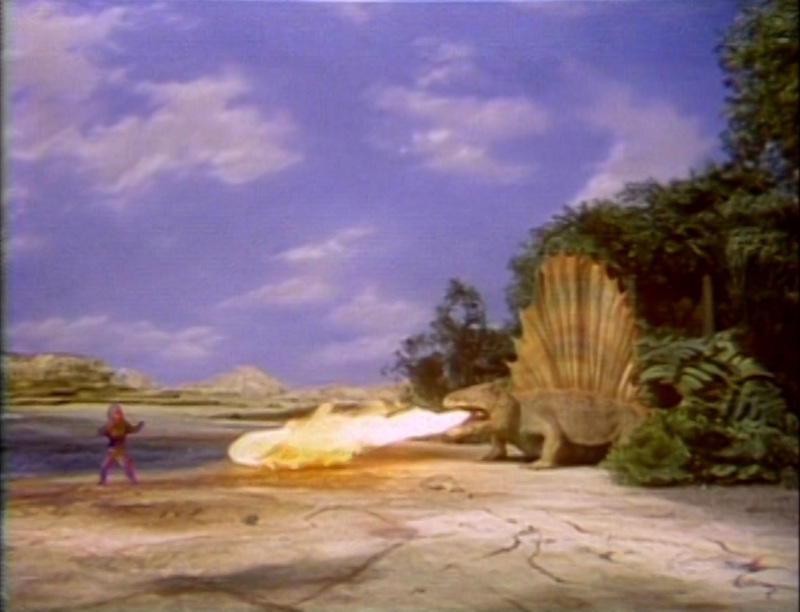 But Cha-Ka is now stranded next to the geyser on a small patch of rock, and will also be killed when the geyser next erupts. Enik explains to Jack that anybody inside the pylon that the temporal regulator controls will be unaffected by reversing the flow of time, and they agree to a deal: Jack reverses time to save Cha-Ka, and then Enik opens a separate door to reverse his own timestream and go home, but then Enik idiotically steps outside and lets Jack get on with it, meaning he gets reversed as well, while Cha-Ka and Torchy get saved. As errors go, that was a massive one. Why in heaven would he do that? In a perfect world, this should have been the season finale, writing out Walker Edmiston’s character, and giving the Marshalls a heroic finale, sacrificing their opportunity to leave to save both Cha-Ka and Enik. Since the series was not going to get renewed – more on that in a couple of weeks, although, since all thirteen episodes were probably taped before the first one aired, they couldn’t have known that – it would have served as the best possible series conclusion from the shows available. So on the one hand, I can’t help but grumble about the missed opportunity, but “Timestop” is nevertheless a really good half hour. It brings back that sense of exploration and discovery that has been badly lacking this year – to its credit, the next episode also has a bit of it, though nowhere as good – and plays with science fiction elements with more success than any other installment this year. The sense of danger is massively ramped up, and the split-second error where Jack accidentally moves time forward, almost killing Cha-Ka with the geyser’s eruption, gave Daniel a sudden and genuine scare. When the episode concludes with another dead end – the resurrected Torchy blasts the pylon with enough heat to fuse its key in place, keeping anybody from entering it to use the temporal regulator – it’s downright heartbreaking. But honestly, what’s really heartbreaking is knowing that Land of the Lost was once this good every week. I remember this episode of Land of the Lost particularly well, too. I didn’t know about the behind-the-scenes problems that you discuss here, but this one remains incredibly vivid but I can’t remember most of the last episodes. Thanks for writing! “Timestop” does seem to be the episode that most people remember from season three, assuming they remember any of that last year, I mean.